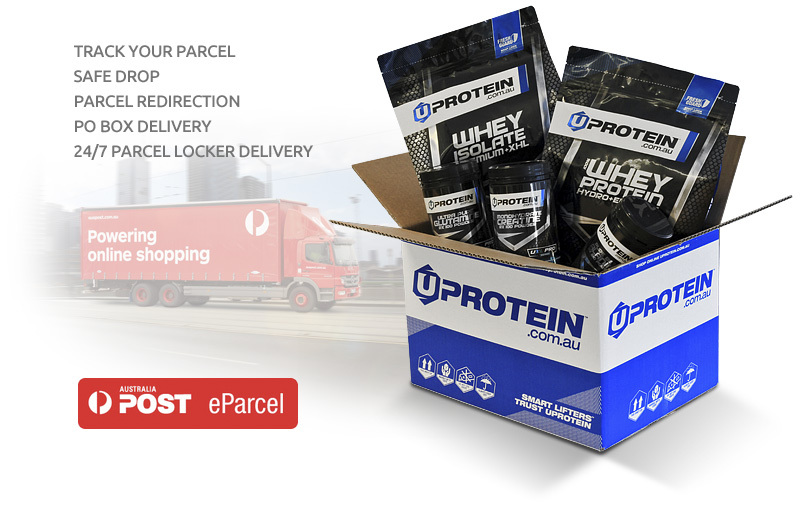 We know you want to get your UPROTEIN supplements with the most flexibility, so we use Australia Post Eparcel Standard delivery service throughout Australia. This service allows complete order tracking, safe drop, re-direct and PO Box delivery. Using Australia Post offers a full featured delivery service but unforeseen delays can occur that are simply out of our control. Please use Australia Post website to track your order. Orders are dispatched Monday-Friday (ex NSW public holidays). Please note we do not allow pickup of deliveries. Orders received before 2pm (Tuesday - Friday) are dispatched from our facility that day, orders received after 2pm will be dispatched on the next business day. Orders placed on the weekend will be sent on the next business day. Orders received on Mondays may be dispatched Tuesdays, due to high order volume over the weekend. **Please note, while we try our best, this is not always a guaranteed service. Delays can occur which result in orders being dispatched at a later date. Orders can be left unattended. This option can be made with Australia Post directly, after you receive your tracking number. Please use their website, sms or mypost app to arrange your preference. Please note if you opt to leave your delivery unattended, IT IS YOUR RESPONSIBILITY. If an item is stolen or misplaced, we will accept no liability and neither will Australia Post. Please ensure you understand this before you take this option. In the event you don't select this option via Australia Post, and you are not available to take delivery of your parcel, a card will be left advising of the procedure to collect your delivery from your nearest Australia Post depot. Orders to East Coast metro areas are usually delivered within 1-5 business days (usually 2-3 days), with regional areas, WA, NT and country areas taking an additional 5-7+ business days. Please allow sufficient time when ordering to receive your supplements at the time you need them. Tracking is available at Australia Post website which can give you an approximate estimation of when your item will be delivered. The estimated time is a guide only and can shorten or lengthen at Australia Post's discretion, so please check regularly. We do our best to deliver your supplements as fast as we can, but sometimes delays can that are out of our control. We only send to Australia addresses, and only accept credits cards issued in Australia. All prices and delivery costs are in Australian dollars. A tracking identifier will be emailed to you once the goods have been dispatched from our warehouse via email. However, this tracking number is only activated once our Australia Post has processed the order so please allow a few hours from receiving your tracking email before checking the status of the delivery. Orders can be tracking via Australia Post website.